Drive off from the highway A4 branching off Dresden-Hellerau. Follow the Hansastraße in the direction centre across the crossroad trainstation Dresden Neustadt. Then take the way about Hainstraße, Große Meißner Straße until Carolaplatz. On the traffic light drive right and cross the river. Now turn two times left in direction Pillnitz. Our hotel is situated on Steinstraße/corner Terrassenufer directly on the river Elbe. Drive off from the highway A4 branching off Dresden-Altstadt. Drive in direction centre along Hamburger, Bremer and Magdeburger Straße. In front of the railway bridge turn off left. 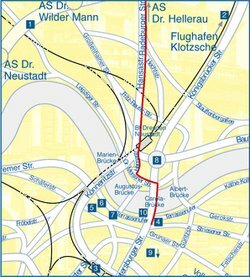 Now follow the mainstreet until Terrassenufer/corner Steinstraße. City train No 2 every 30 minutes goes to the main station or station Dresden Neustadt. From both stations take the tram No 3. Get off at the stop Synagoge. It is 50 m off the hotel. From the main station tram No 7 is possible too. fee required from Monaday till Saturday from 8 a.m. until 8 p.m.
fee required every day from 8 a.m. until 8 p.m.